Jenkintown, PA (January 19, 2007)  Malanka (Staryj Novyj Rik  Old New Year's Eve) is a Ukrainian folk holiday celebrated on January 13th in accordance with the Julian calendar. Malanka commemorates the feast day of St. Melania and it traditionally caps off the festivities of the Christmas holidays. Thus, it is often the last opportunity for partying and festivities before the solemn period of Lent, which precedes Easter. Keeping this Ukrainian tradition alive, but maintaining a unique Caribbean twist, the Ukrainian Educational and Cultural Center celebrated its Malanka with almost 100 UECC members and friends on the open seas far, far away from its home in Jenkintown, Pa. Setting sail from Miami, Florida for a seven-day Western Caribbean cruise on the Norwegian Sun, the festivities began on Saturday, January 12 and lasted until Saturday, January 19, 2008 while visiting exotic ports of call including Roatan in Honduras, Belize city in Belize, Cozumel in Mexico, and Norwegian Cruise Line's private island of Great Stirrup Cay in the Bahamas. Each day provided UECC members and friends with new adventures, experiences and opportunities for exploration, tourism, and shopping. Making new friends within the traveling group was easy and became a daily occurrence - everywhere one turned, one saw a friendly smiling Ukrainian face (sometimes even wearing the UECC Malanka cruise group t-shirt). Between morning power walks, comedy shows, boat safety drills, art auctions at sea, bingo, karaoke, theatrical shows, spa sessions, massages, workouts on the treadmills, and soaks in the Jacuzzi, the UECC group found time onboard to meet and dine together. On Sunday, the first full day at sea, everybody was seated together at the Four Seasons Restaurant in beautiful Ukrainian attire - vyshyvky, the UECC group was truly united in spirit - eating, drinking and like a family, celebrating ten birthdays and even a sixty-year wedding anniversary. Imagine all of those "Mnohaya Litas"! The group met immediately after dinner for the official photo and the UECC Malanka Zabava/Dance at the Great Outdoor Cafe began to the sound of the waves and under the Caribbean starry skies. The fabulous ship's band, "Brothers and Friends", gave all present a chance to dance the night away or sit back and enjoy the sunset. The group managed to meet again later in the week, on Thursday, for a farewell cocktail party in the Observation Lounge with jokes and a sing-along. A raffle was held and lucky winners received UECC Malanka Cruise canvas bags with some lovely surprises. On land, many broke up into smaller groups and explored the best of what the Caribbean had to offer including sightseeing, beach parties, dolphin encounters, forest adventures, canopy tours and aerial treks, snorkeling with stingrays and Nurse-sharks, exploring Mayan ruins, and of course, the shopping. But the last day on the island of Great Stirrup Cay provided the group with that final chance to spend the day together on the beach and in the beautiful, clear, warm water. Seizing the opportunity, the UECC group actively enjoyed itself with volleyball games, snorkeling, swimming, sunbathing, walks along the shore, a BBQ lunch, drinks, shopping for those last souvenirs, jokes and lots of reminiscing. The tour was lucky to have a week of great weather and relatively calm sailing. The group, of almost 100 UECC members and friends, from Pennsylvania, New Jersey, New York, Connecticut, Maryland, North Carolina, Florida, California, and Canada relaxed in the sun, met new people, mingled, bonded and reconnected with old friends and with their positive attitude and good fun contributed to the success of the cruise. To see first hand, please visit the UECC website, www.ueccphila.org, for photos and videos from the cruise. 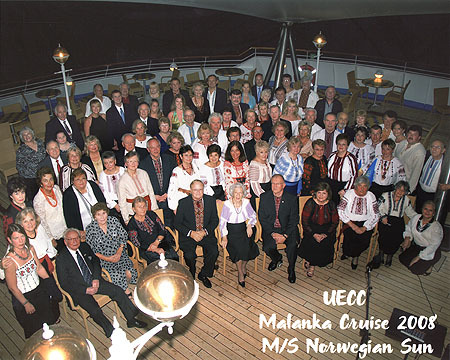 The Ukrainian Educational and Cultural Center and its Board of Directors wholeheartedly thank Zenia Brozyna of Zenia's Travel Club, LLC for creating, organizing and leading the 2008 UECC Malanka Cruise. The UECC would also like to thank its members and friends - those who supported the successful fundraiser, raised money for the UECC by attending the cruise, and, in the process, relaxed, swam, sunbathed and had a wonderful Caribbean adventure in the company of Ukrainian friends as well. The Ukrainian Educational and Cultural Center, founded in 1980, is a non-profit organization whose objective is to preserve and promote awareness of Ukrainian heritage throughout the Philadelphia community. The UECC is located at 700 Cedar Road in Jenkintown, PA 19046 and can be reached at 215-663-1166 or e-mail at contact@ueccphila.org. Visit us on the web at www.ueccphila.org.